When I purchased my VW Vanagon in February 2010 I knew absolutely nothing about it! All that I knew was that I liked it and I had this dream of me going on long trips with my friends. I remember driving it to my place for the first time at night. I was with my good friend Eric and we had loaded my motorbike into the van in order to drive it back. After a few kilometers, the van started heating up. All we could hear from the front was the sound of boiling water and hissing steam. We stopped to let it cool three times on the way and the very next day my quest to restore the van began. The first thing I realized was that there is nothing like a knowledgable and cheap mechanic! This is because I got a mechanic to help me deal with the overheating. His reasons for the van overheating did not make sense to me and I thought I should not allow him to do anything at first while I sought a second opinion. The second opinion was not cheap and it was also concluded in 2 minutes. 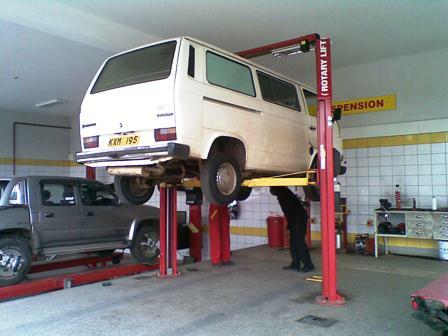 Mr. Kinuthia, a wise old head in the business of VW Transporter repair only took one look at the expansion bottle pressure cap and told me that was the problem. He then proceeded to procure the part on my behalf and installed it and voila! the problem was gone. I was happy but the cost really bothered me. I did not think that a plastic cap would be as expensive as Mr. Kinuthia made it out to be. So I started by going to the premier dealer in all Volkswagen vehicles in Kenya, CMC motors and asked for all sorts of spare parts. When I finally found one they did not have, I requested them to recommend where else I would find it and the mentioned Impala Auto Spares just down the road. Since then whenever I do not find a part at a dealer, I always seek reference from those dealers and in Kenya they have a great culture of gladly referring you to competition. As a result I now know a number of places to shop for spare parts in Kenya. Another important aspect while shopping for spares is knowing your car. Knowing the part and better still offering the part number is a wonderful way of ensuring that the dealers serve you correctly and accurately. You can also shop more aggressively for good deals on parts when you have such information. For my van I always work with VW Heritage Parts and Van Cafe. Their websites breakdown the entire vehicle and give you each spare including the price they sell it at. This usually forms a basis for my search for parts as I always know what price to expect and I can now identify a good deal when I come across one. So while shopping for spare parts; research, research, research. some very juicy information here brother. of-course if there is something we are good at is research. whats the year of make of this beauty? I insist on a before & after shot-of both your hands & the van……..the van is improving, I think your hands will NEED restoration after the van is complete! Hello Frank! Not exactly sure the price right now but if I remember right I once bought one for 8K. There are two types, magneto and the one that takes vacuum from carb. The one I bought was the one that takes vacuum from carb. Distributor cap will not be in that price. I also have a shiny new ignition coil. Bought it but it does not go with my HT leads so its just lying there. IF interested let me know. All the best, post a picture of your van if possible! An absolutely excellent piece on the beautiful VW Vanagon! We had a client a few years ago who told us that the vehicle he always dreamt of driving when he was young was a VW Vanagon. Amazing things happen because he actually got a good deal on one and was over the moon when he drove it for the first time. I am truly amazed to read this piece about your very hands-on experience with a similar beauty. Have you finished the restoration job or are you still working on it? Do you have a few images of the Vanagon as it looks today? I would love to send this client of ours a few images of your completed works. Hello Tom. Great to hear from you. The VW Vanagon is a magnificent and highly addictive vehicle. Currently I have removed the engine from my van. I was considering putting in a Subaru but after a couple of months of consideration, research and searching, I have decided to put back the old engine with the annoying parts replaced. I am also planning to repaint it. So as far as photos go, am not really able to give you anything beyond what you are seeing. I had moved the blog to diy.onemanspanner.com but am considering returning it full time to WordPress, where you found this. But visit diy.onemanspanner.com to see more photos and work on the van. Besides me, there’s an entire community of guys who are maintaining these vans on a regular basis. Thank you very much for being in touch!